Moisture presence, salts precipitation and crystallization, UV irradiation are main deterioration problems of the building materials of historic monuments. Many commercial stone consolidation and water repellent products contain Tetraethoxysilane (TEOS). Nanomaterials by adding TiO2 nanoparticles to TEOS based commercial products; Rhodorsil RC-70 and RC-90 were synthesized. The morphologies of the surfaces were investigated by scanning electron microscopy. The protective properties of the nanomaterials on a dolomite marble substrate against moisture and salts weathering were examined by water capillary absorption tests and accelerated aging tests in UV irradiation conditions. Capillary tests were carried out in saturated solutions of sodium chloride, sodium sulphate and mixture of these salts. The investigation of the moisture presence and distribution, the form and the amount of the salts crystallized on the surface as well as the height of the capillary rise were performed by gravimetric measurements, optical observation and XRD. The aging behaviour investigation was performed by contact angle, colorimetric and FTIR measurements. The morphologies of the coatings surface were found to depend on the type of the polymeric material and the addition of the nanoparticles. Salt crystallization and the height of the capillary rise depended on the type of the salt also. Sodium chloride was the major salt phase determined but the presence of Na2SO4 in the weathering environment caused not only the extraction of the efflorescence salts but also marble fragments. The polymer coatings decreased water absorption and salt crystallization and increased contact angle values. The presence of methyl-phenyl resin in the polymer coating and the addition of nanoparticles lead to the formation of a coating with improved hydrophobic and anti-UV properties. Stone and marble are main building materials of historic monuments and are subject to the action of environmental factors, leading to weathering. Weathering can be physical, chemical or biological and decay of stone is usually the result of a combination of these types. Pollution in the atmosphere is an important factor in causing decay. The presence of moisture increases weathering rate as water holds in solution and transports weathering agents on the material surface [1-5]. Typical such agents are sulphate, chloride, nitrite and nitrate ions that reacting with the hydrogen ions of water act as acids, attack the carbonate material and lead to the formation of sulphate, chloride and nitrate salts . Crystallization and hydration of weathering products result in their expansion causing the degradation of the building materials. In most cases the stone surfaces are gradually covered by salts and black crusts containing calcium, magnesium, sodium, potassium sulphates, nitrates and other constituents. Also the water can easily penetrate and remain into the building stone materials, resulting in a destructive influence due to the absorption and evaporation of the moisture that affects their volume and causes cracks leading to the deterioration of the structure. Under these conditions, the stone surfaces disintegrate into powder and the building materials gradually lose their mechanical strength and their artistic form. In the case of marbles the main mechanism of deterioration is the sulphation of their surfaces, leading to the formation of gypsum layers on the stone surface, due to the solid state diffusion of Ca2+ [7-14]. As a result of the exposure in environmental weathering, moisture presence, salts precipitation and crystallization are main deterioration problems of the building materials of historic monuments. The presence of moisture in a material is due to capillary rise and falling damp. The total moisture content and the contributions of these forms in a specific material will depend on the amount and nature of the salts in the soils beneath, on the humidity and temperature. For salt weathering to occur there must be a combination of conditions of permeable material, available moisture, available soluble salts and evaporation. The presence of salts changes the liquid transport properties of marbles, influencing also their structure and surface stability. Repeated wetting and drying with seasonal changes lead to the cyclic precipitation of salts and the progressive decay of the building material. When the rate of evaporation from the material surface is low, the evaporative front may be at or very near the surface, in which case salt crystals will grow from the surface, as efflorescence. When the rate of evaporation is much greater, the evaporative front will be inside the wall and salts will crystallize within the pores of the material, as sub-florescence [15,16]. Polymeric coatings are widely used for the consolidation and protection of the building materials of historic monuments. These protective coatings must combine various properties such as hydrophobicity, transparency, durability, blocking liquid water entry and let it escape as vapour, chemical stability and stability to the alterations of climatic conditions and to the negative effects of the ultraviolet radiation from sunlight, compatibility with the surface of monuments, good penetration, solidification strength, appropriate simultaneous physical and mechanical properties, service life, aging history and reversibility of the application [17-19]. These polymers usually consist of synthetic organic polymers and hybrid organic-inorganic materials. Polymers based on various acrylics, known as Paraloids, are widely used in the conservation of monuments. As surface hydrophobicity increases lowering the surface energy, fluoropolymers are also known as protective materials because of their photostability, oil and water repellency, antifouling properties and minimized critical surface tension [2,18]. Hybrid organic-inorganic materials have extraordinary properties deriving from the combination of the different building blocks. In such systems, polymer blocks lead to good adhesion, toughness; flexibility and ease of processing and inorganic blocks improve the mechanical properties such as abrasion resistance, optical properties and heat resistance. The final properties of the hybrid systems are not only determined by the volume fractions of organic and inorganic components, but also affected by several parameters such as size, morphology and size distribution of inorganic particles, homogeneity of dispersion of organic and inorganic phases, amount of phase separation, morphology of hybrid system, molecular weight of organic polymer and its solubility in the sol-gel solution, and the number of reactive groups and coupling agents. Unfortunately some of these properties are competitive with each other . The alkoxysilanes such as Methyltrimethoxysilane (MTMOS) and Tetraethoxysilane (TEOS) have widely been used as protective materials due to its low viscosity and its ability to form Siloxane (Si-O-Si) bonds. The alkyl-modified alkoxysilanes-based coatings are known as organic-inorganic hybrids systems because of their alkyl groups as organic component and silicon backbone as inorganic one. Many works reported the synthesis of organic-inorganic hybrids from various polymers and silica nanocomposite coatings containing different kinds of nanoparticles such as metal oxides and hydroxides, SiO2, ZnO, ZrO2, TiO2, Ca(OH)2, Mg(OH)2, Ba(OH)2, Sr(OH)2, carbonates, silicon-containing compounds, organoclay compounds [18,20-27]. Many commercial formulations of stone consolidants based on alkoxysilanes (mainly MTMOS and TEOS) were synthesized. Such products are Wacker (OH, OH100), Conservare (OH100, H100), Silex (OH, H), Tegovakon (V, T), Funcosil (OH, 100, 300, 500), Brethane, Rhodorsil (RC-70, RC-80, RC-90). All these products contain monomer or oligomeric TEOS or MTMOS, solvents and a catalyst in various compositions. Some of these also contains a water-repellent component . Aim of the present work was the study of the protective properties of nanocomposite coatings synthesized by adding TiO2 nanoparticles to TEOS based commercial products, Rhodorsil RC-70 and RC-90, on a dolomite marble substrate against salts weathering. White Greek dolomite marble of Thassos (86% dolomite, 12% calcite, 2% quartz, porosity 0.45%) was used as substrate. The dimensions of the specimens were 5x10x2 cm and before treatment were washed with deionised water and acetone, dried and weighted. Five series of specimens of dolomite marble were prepared. Bare marble and marble coated with four types of coatings, Rhodorsil RC-70, Rhodorsil RC-90, Rhodorsil RC-70 with 3% TiO2 nanoparticles and Rhodorsil RC-90 with 3% TiO2 nanoparticles. The preparation of coated marble specimens was realized by immersion in the corresponding solution for 30 min. The commercially available product Rhodorsil RC-70 contained 70% oligomeric TEOS, 30% white spirits and a neutral organoditin-siloxane catalyst. Rhodorsil RC-90 contained 70% oligomeric TEOS, methylphenylsilicone (water-repellent component), 24% white spirits, 6% toluene and a neutral organoditin-siloxane catalyst. TiO2 nanoparticles with a diameter of 24nm (Degussa TiO2 P-25, ~70% anatase and ~30% rutile), were used for mixing with the above polymeric materials. The mixtures were stirred vigorously for 20 min in order a homogeneous dispersion to be prepared. After the evaporation of the solvent the specimens were dried and weighted for the calculation of the polymer uptake by marble substrate. The morphologies of the surfaces were investigated by scanning electron microscopy (SEM, JEOL JSM 840 Α with Oxford EDS-WDS analyser). Capillary absorption measurements were performed by the gravimetric sorption technique. The dried weighted specimens were placed on a filter paper pad (1cm of Whatman paper, No 4) partially immersed in distilled water or in three different saturated solutions of sodium chloride (NaCl solubility at 20˚C 359gl-1), sodium sulphate (Na2SO4 solubility at 20˚C 195gl-1) and 50%-50% mixture of these salts. The capillary tests were carried out for a period of seven days and the specimens were extracted and weighted to determine the amount of water absorbed by capillary forces and the amount of salts crystallized. After drying, the specimens were weighted again to determine the desorbed and the remained water. 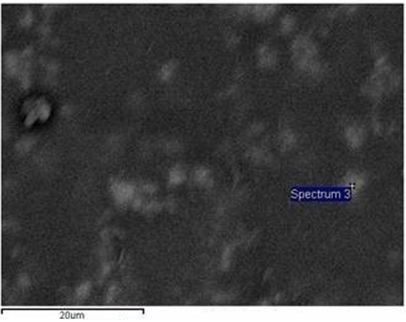 The investigation of the behaviour of the coatings, the moisture presence and distribution, the form and the amount of the salts crystallized on the surface as well as the height of the capillary rise were performed also by optical observation and X-Ray Diffraction (XRD). XRD measurements were carried out using a Rigaku Mini Flex II diffractometer with CuKα radiation. L⁎: brightness (0 for black-100 for white), a⁎: red-green component (positive for red and negative for the green colours), b⁎: yellow-blue component (positive for yellow and negative for the blue colours). FTIR measurements were carried out using a Spotlight 400 FT-IR Imaging System Perkin-Elmer spectrophotometer. The results presented in this work are the average of the results obtained on three different samples of the same type of specimen. The results of the calculation of the polymer uptake by marble substrate are shown in table 1. Increased coating uptake was observed in the case of RC-90 and RC-90+TiO2 in comparison to RC-70 and RC-70+TiO2. This can be attributed to the increased elasticity of the structure of RC-90, due to the presence of the methylphenyl component, which allows a greater polymer absorption in the substrate. The addition of nanoparticles did not affect significantly polymer uptake. The morphologies of the coated surfaces, SEM-EDS analysis and a cross-section image of coated marble are shown in figures 1-4. As shown in the images, in the case of RC-70 (Figure 1a) a continuous film with smooth surface was formed. In the case of RC-90 (Figure 1b) an obviously rough coating was formed, increasing the hydrophobicity of the marble. This is attributed to the methyl-phenyl resin, which helps to form a more complex structure with branches, in combination with the Si-O-Si chains. The surface of RC-70 + TiO2 (Figure 1c) was less smooth than the corresponding surface of RC-70. In both cases of composite coatings titanium agglomerates were formed. Basic difference between the two composite coatings is that in the case of RC-70 + TiO2 (Figure 1c) the agglomerates formed were not coated by the polymer. 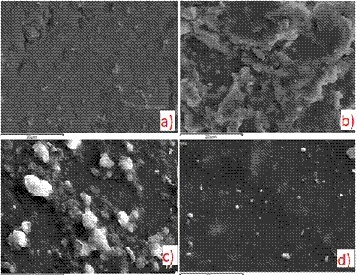 In the case of RC-90 + TiO2 (Figure 1d), nanoparticles were best dispersed and agglomerates appeared coated by the polymer. The difference in the surface morphology of RC-90 coating (Figure 1b) after adding TiO2 nanoparicles (Figure 1d) is attributed to the incorporation and dispersion of the nanoparticles in the polymer structure. In both cases of coatings nanoparticles addition increased hydrophobicity due to the total change of surface morphology in the case of RC-90 or due to the presence of titanium agglomerates in the surface coating in the case of RC-70. These observations were confirmed with the SEM-EDS analysis results (Figures 2-3). 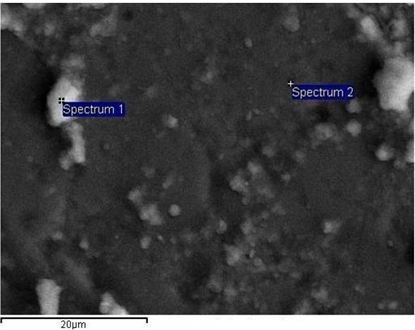 In figure 2, RC-70 + TiO2 coating, titanium agglomerates not coated by the polymer (spectrum 1) are shown; while in the area of spectrum 2 the titanium presence is minimum. In figure 3, RC-90 + TiO2 coating, titanium agglomerates coated by the polymer (spectrum 3) are shown. 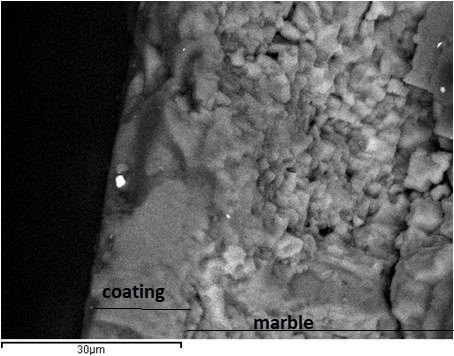 In all cases of coated marbles the coating thickness was ~ 15μm (Figure 4). The cross-section images of the other coated marbles were similar. The gravimetric results of the capillary tests are shown in table 2. All values in salts solutions were greater than the corresponding in water as in the first ones salts crystallization was observed also. The water absorption and salts crystallization was greater in the case of sodium chloride, lower in the case of sodium sulphate and intermediate in the case of salts mixture, as it was expected due to the lower solubility of sodium sulphate. All coatings used decreased water absorption. The results were better for Rhodorsil RC-90 than Rhodorsil RC-70, attributed to the presence of methyl-phenyl resin in the first one. The addition of TiO2 decreased water absorption and salts crystallization also. The results of the optical examination of the specimens after the capillary tests are shown in figure 5. From the observation of the images of figure 5 followed that in all cases of bare or coated marble the height of the capillary rise and salts crystallization on the surface of the specimen was greater in the case of sodium chloride, lower in the case of sodium sulphate and intermediate in the case of salts mixture. All coatings used decreased the height of the capillary rise and salts crystallization on the marble surface. The results were better for RC-90 than RC-70. In the case of RC-70 coating, the addition of TiO2 nanoparticles did not influence the height of the capillary rise. In the case of RC-90 coating, the addition of TiO2 nanoparticles decreased the height of the capillary rise in a sodium chloride corrosive environment. In corrosive environments of sodium sulphate or salts mixture the corresponding results appeared similar. This observation is attributed to the low water absorption and salts crystallization values, as shown in the results of table 2.XRD analysis was carried out on the powder of the salts crystallized on the surfaces of the various series of the specimens, after their removal from the surface and the results are presented in figure 6 and table 3. From the results followed that sodium chloride was the major salt phase determined. Moreover, halite was determined between 55 and 84w/w% in NaCl-weathering environment and 3 to 67w/w% in mixed NaCl+Na2SO4-weathering environment. In Na2SO4-weathering environment only minor amounts of sodium salts (natron, nahcolite and thenardite) were determined. During salts removal from the marble surface, the presence of NaSO4 in the weathering environment caused not only the extraction of the efflorescence salts but also marble fragments as it was concluded from the high amounts of dolomite determined. Comparing Rhodorsil coating materials the addition of TiO2 significant decreased the crystallization of salts only for Rhodorsil RC-90.The results of contact angle and colour alteration measurements before and after exposing in aging conditions are shown in table 4 and figures 7 and 8.From the results of table 4 and figures 7 and 8 followed that all coatings used increased contact angle indicating increased hydrophobicity. The results were better for RC-90 than RC-70. Hydrophobicity was also increased by the addition of TiO2 nanoparticles. In all cases contact angle decreased slightly after exposure in aging conditions. The total color difference (Δ Ε ⁎) values obtained from the colorimetric measurements are presented in table 4. From these values followed that the colour difference due to the RC-70 coating was lower compared to the colour difference caused by RC-90 coating. The addition of TiO2 nanoparticles decreased colour difference. Exposure in aging conditions caused slight colour variations. The increase of final colour variation of RC-90 and RC-90+TiO2 from 2.4 to 2.8 may be attributed to the different behaviour of a surface with titanium agglomerate coated by the polymer in the last case, but further investigation is needed to confirm this supposition. The results of FTIR analysis before and after exposing in aging conditions are shown in figure 9. In the IR spectra of figure 9 the absorption bands corresponding to the Si-O bond, (1080-1130cm-1), are distinctly observed in all cases. In the curves of the aged RC-70 (Figure 9b) and aged RC-90 (Figure 9e), they are wider and weaker, as expected. In figures 9a and 9d, it is shown that the addition of titanium oxide, as a result the formation of a better layer on the marble surface, as indicated from the stronger absorption bands. The influence of exposure in aging conditions is lower in the cases of RC-70 + TiO2 (Figure 9c) and RC-90 + TiO2 (Figure 9f) coatings. From the results of the present work followed that the main actions of the addition of TiO2 nanoparticles in the polymer coating are the anti-UV protection and the improvement of hydrophobictity, in accordance with the results of previous work  where we have found that the addition of titanium dioxide pigments in a widely used consolidant, Paraloid B72, acts predominantly as a physical UV absorber and significantly improved the photostabilization of films against UV irradiation. These results are also in accordance with the results of other works where it was found that organic-inorganic hybrid coatings prepared with TiO2 nanoparticles had hydrophobic properties and improved corrosion resistance of metals [28,29]. Also super-wetting/antiwetting surfaces with extremely high contrast of surface energy and liquid adhesion have fabricated with TiO2-based surfaces . The surface morphologies and the hydrophobic properties of the coatings depend on the type polymeric material, the addition of the nanoparticles. Basic difference between the two composite coatings is that in the case of RC-70 + TiO2 the agglomerates formed were not coated by the polymer while in the case of RC-90 + TiO2 nanoparticles were best dispersed and agglomerates appeared coated by the polymer. Salts crystallization and the height of the capillary rise depended also on the type of the salt. Sodium chloride was the major salt phase determined but the presence of Na2SO4 in the weathering environment caused not only the extraction of the efflorescence salts but also marble fragments. Polymer coatings decreased water absorption and salt crystallization and increased contact angle values. The presence of methyl-phenyl resin in the polymer coating and the addition of nanoparticles lead to the formation of a coating with improved hydrophobic and anti-UV properties decreasing water absorption from 0.117% in the case of bare marble to 0.022% in the case of RC-90 + TiO2 coating and increasing initial contact angle values from 73.57o to 117.52o and final contact angle values after exposure in aging conditions from 69.53o to 97.58o correspondingly. The main actions of the addition of TiO2 nanoparticles in the polymer coating are the anti-UV protection and the improvement of hydrophobicity. Camuffo D, Fassina V, Havermans J (2010) Basic environmental mechanisms affecting cultural heritage: Understanding Deterioration Mechanisms for Conservation Purposes, Kermes quaderni. Nardini Editore, Firenze, Italy. Torraca G (2009) Lectures on Materials Science for Architectural Conservation, The Getty Conservation Institute, Los Angeles, USA. Lan TTN, Nishimura R, Tsujino Y, Satoh Y, Thoa NTP, et al. (2005) The effects of air pollution and climatic factors on atmospheric corrosion of marble under field exposure. Corrosion Science 47: 1023-1038. Spathis P, Papanikolaou E, Melfos V, Samara C, Christaras B, Katsiotis N (2015) Characterization and Weathering of the Building Materials of Sanctuaries in the Archaeological Site of Dion. Trends Journal of Sciences Research 2: 95-103. Papanikolaou E, Spathis P, Samara C, Melfos V, Christaras B, et al. (2012) Effect of environmental factors to the deterioration of stones monuments in the Archaeological Site of Dion. International Conference Protection and Restoration of the Environment XI, Thessaloniki, Greece. Borrelli E, Urland A, Jaqualnta MT, Schmid W (1999) Conservation of Architectural Heritage, Historic Structures And Materials. ICCROM UNESCO WHC ARC Laboratory Handbook, Rome, Italy. Camuffo D, Del Monte M, Sabbioni C, Vittori O (1982) Wetting deterioration and visual features of stone surfaces in an urban area. Atmospheric Environment 16: 2253-2259. Camuffo D, Del Monte M, Sabbioni C (1983) Origin and growth mechanisms of the sulfated crusts on urban limestone. Water Air and Soil Pollution 19: 351-359. Del Monte M, Sabbioni C, Vittori O (1984) Urban stone sulphation and oil-fired carbonaceous particles. The Science of the Total Environment 36: 369-376. Del Monte M, Sabbioni C, Ventura A, Zappia G (1984) Crystal growth from carbonaceous particles. The Science of the Total Environment 36: 247-254. Rodriguez-Navarro C, Sebastian E (1996) Role of particulate matter from vehicle exhaust on porous building stones (limestone) sulfation. The Science of the Total Environment 187: 79-91. Simao J, Ruiz-Agudo E, Rodríguez-Navarro C (2006) Effects of particulate matter from gasoline and diesel vehicle exhaust emissions on silicate stones sulfation. Atmospheric Environment 40: 6905-6917. Dei L, Mauro M, Baglioni P, Manganelli Del Fa C, Fratini F (1999) Growth of Crystal Phases in Porous Media. Langmuir 26: 8915-8922. Maravelaki-Kalaitzaki P (2005) Black crusts and patinas on Pentelic marble from the Parthenon and Erechtheum (Acropolis, Athens): characterization and origin. Analytica Chimica Acta 532:187-198. Young D (2008) Salt attack and rising damp, Technical Guide, Melbourne, Australia. Moreno F, Vilela SAG, Antunes ASG, Alves CAS (2006) Capillary-rising salt pollution and granitic stone erosive decay in the parish church of Torre de Moncorvo (NE Portugal)-implications for conservation strategy. Journal of Cultural Heritage 7: 56-66. Doehne E, Price CA (2010) Stone conservation: an overview of current research. The Getty Conservation Institute, Los Angeles, CA,USA. Sadat-Shojai M, Ershad-Langroudi A (2009) Polymeric Coatings for Protection of Historic Monuments: Opportunities and Challenges. Journal of Applied Polymer Science, 112: 2535-2551. Moropoulou A, Kouloumbi N, Haralampopoulos G, Konstanti A, Michailidis P (2003) Criteria and methodology for the evaluation of conservation interventions on treated porous stone susceptible to salt decay. Progress in Organic Coatings 48: 259-270. Wheeler G (2005) Alkoxysilanes and the Consolidation of Stone. Getty Conservation Institute, Los Angeles, CA, USA. Baglioni P, Chelazzi D (2013) Nanoscience for the Conservation of Works of Art. The Royal Society of Chemistry, Cambridge, UK. Maravelaki-Kalaitzaki P, Kallithrakas-Kontos N, Agioutantis Z, Maurigiannakis S, Korakaki D (2008) A comparative study of porous limestones treated with silicon-based strengthening agents. Progress in Organic Coatings 62: 49-60. Spathis P, Karapanagiotis I, Manoudis P, Kantiranis N, Zacharopoulou (2015) A Nanocomposite coatings for the protection of marble against salts weathering. 12th International Conference on Nanosciences & Nanotechnologies (NN15), Thessaloniki, Greece. Spathis P, Karagiannidou E, Magoula AE (2003) Influence of Titanium Dioxide Pigments on the Photodegradation of Paraloid Acrilic Resin. Studies in Conservation 48: 57 -64. Manoudis PN, Tsakalof A, Karapanagiotis I, Zuburtikudis I, Panayiotou C (2009) Fabrication of super-hydrophobic surfaces for enhanced stone protection. Surface & Coatings Technology 203: 1322-1328. Manoudis PN, Karapanagiotis I, Tsakalof A, Zuburtikudis I, Kolinkeová B, et al. (2009) Superhydrophobic films for the protection of outdoor cultural heritage assets. Appl Phys A 97: 351-360. Tsakalof A, Manoudis P, Karapanagiotis I, Chryssoulakis I, Panayiotou C (2007) Assessment of synthetic polymeric coatings for the protection and preservation of stone monuments. Journal of Cultural Heritage 8: 69-72. Shen GX, Chen YC, Lin L, Lin CJ, Scantlebury D (2005) Study on a hydrophobic nano-TiO2 coating and its properties for corrosion protection of metals. Electrochimica Acta 50: 5083-5089. El-Mahdy GA, Atta AM, Al-Lohedan HA, Tawfeek AM, Ahmed Abdel-Khalek A (2015) Synthesis of Encapsulated Titanium Oxide Sodium 2- Acrylamido-2-methylpropan Sulfonate Nanocomposite for Preventing the Corrosion of steel. Int. J. Electrochem. Sci 10: 5702- 5713. Huang J-Y, Lai Y-K (2015) TiO2 -Based Surfaces with Special Wettability - from Nature to Biomimetic Application. In: Aliofkhazraei M (ed.). Wetting and Wettability, Intech Open Science, Rijeka, Croatia. Figure 4: SEM cross-section image of RC-70 coated marble. Figure 5: Capillary tests, optical examination of bare and coated specimens after 7 days exposure in various salts solutions. 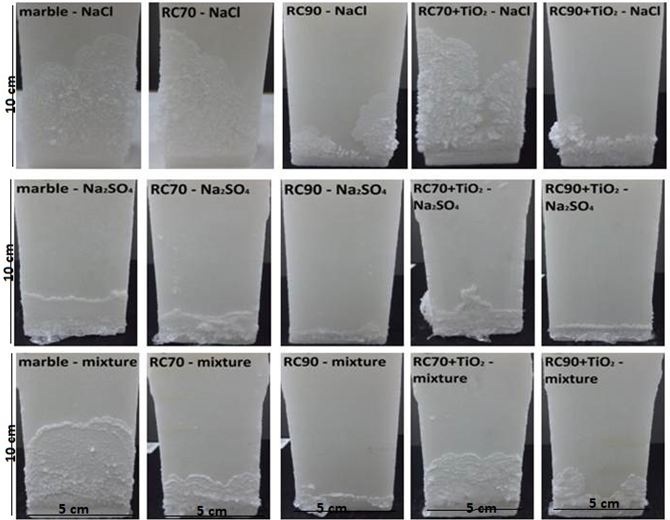 Figure 6: XRD analysis of the powder of the salts crystallized on the surfaces of the various series of specimens (A: Marble, B: RC-70, C: RC-90, D: RC-70+TiO2, E: RC-90+TiO2). Figure 7: Contact angle measurements before exposing in aging conditions: a) Bare b) RC-70 c) RC-90 d) RC-70 + TiO2 e) RC-90 + TiO2. Figure 8: Contact angle measurements after exposing in aging conditions: a) Bare b) RC-70 c) RC-90 d) RC-70 + TiO2 e) RC-90 + TiO2. 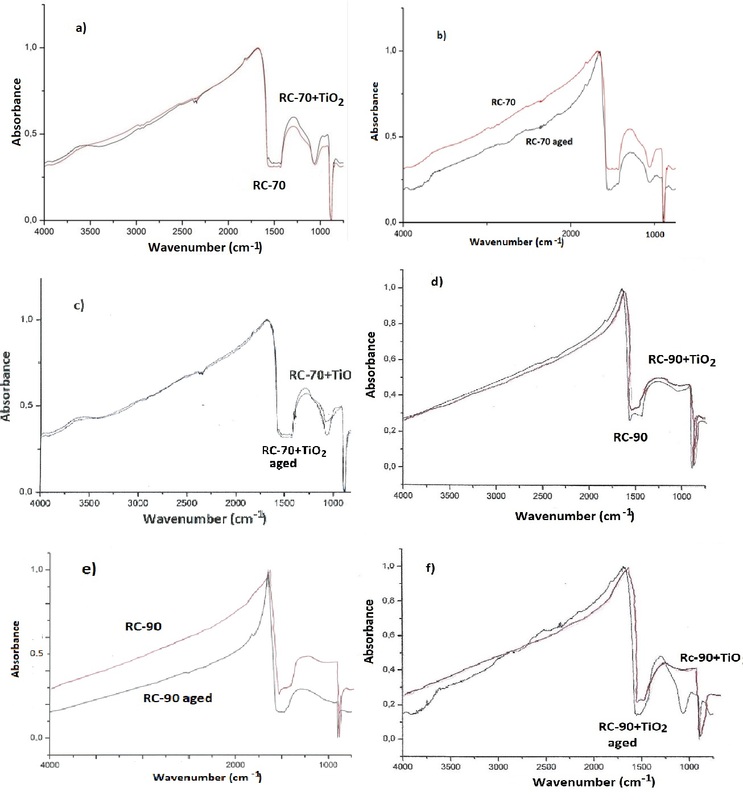 Figure 9: FTIR diagrams of a) RC-70 and RC-70+TiO2, b) RC-70 before and after exposing in aging conditions, c) RC-70+TiO2 before and after exposing in aging conditions, d) RC-90 and RC-90+TiO2, e) RC-90 before and after exposing in aging conditions, f) RC-90+TiO2 before and after exposing in aging conditions. Table 2: Results of capillary tests, absorption, desorption, remained w % increase. Table 3: Results of capillary tests, absorption, desorption, remained w % increase. Table 4: Contact angle and colour alteration results before and after exposing in aging conditions. Citation: Spathis P, Karapanagiotis I, Manoudis P, Kantiranis N, Zacharopoulou A (2017) Protection of Dolomite Marble against Salts Weathering with Titanium Dioxide Nanocomposite Coatings. J Mod Chem Sci 1: 001.